The Indian Wells Masters, also known as BNP Paribas Open and the WTA Indian Wells Open, is an annual tennis tournament held in early- and mid-March at the Indian Wells Tennis Garden in Indian Wells, California, United States. The current owner is Larry Ellison, CTO and co-founder of Oracle. The current tournament director is former world No. 2 player Tommy Haas. The tournament is a Masters 1000 event on the men's tour and is a Premier Mandatory event on the women's tour. Between 1974 and 1986 it was a secondary tournament of the Grand Prix Tennis Tour but in 1987 it was upgraded to be part of the Grand Prix Super Series, the series of nine tournaments just below the four majors and the year-end finals in importance. It took the place of the Philadelphia Indoor event as the first Super Series event of the year. The event is one of two tour events (along with the Miami Open), other than the Majors, in which main draw play extends beyond eight days. The women's main draw usually starts on Wednesday and the men's main draw starts on Thursday. Both finals are held on Sunday of the following week. Both singles main draws include 96 players in a 128-player grid, with the 32 seeded players getting a bye (a free pass) to the second round. The tournament is played on hardcourt and is the best-attended tennis tournament outside the four Grand Slam tournaments. It has the second-largest permanent tennis stadium in the world (the Arthur Ashe Stadium being the largest). Indian Wells lies in the Coachella Valley (Palm Springs area), about 125 miles east of downtown Los Angeles. 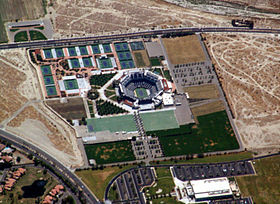 The tournament is played in the Indian Wells Tennis Garden (built in 2000) which has 29 tennis courts, including the 16,100-seat main stadium, which is the second largest tennis-specific stadium in the world. After the 2013 BNP Paribas Open the Indian Wells Tennis Garden started an expansion and upgrade of its facilities that includes a new 8,000 seat Stadium 2. The tournament was founded by former tennis pros Charlie Pasarell and Raymond Moore. The Pacific Life Open (2002–2008). Originally the women's tournament was held a week before the men's event. In 1996, the championship became one of the few fully combined events on both the Association of Tennis Professionals and Women's Tennis Association tours. 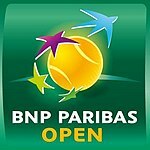 The BNP Paribas Open has become one of the largest events on both men's and women's tour. In 2004 it expanded to a multi-week 96 person field, and since then, it along with the following Miami Open, have been colloquially termed the Sunshine Double. Dubbed the "Grand Slam of the West", it is the most-attended tennis tournament in the world other than the four Majors, with over 450,000 visitors during the 2015 event. In 2009, the tournament and the Indian Wells Tennis Garden were sold to Larry Ellison. Venus and Serena Williams, two very successful American players, refused to play the Indian Wells tournament from 2001 to 2014 despite threats of financial sanctions and ranking point penalties. The two were scheduled to play in the 2001 semifinal but Venus withdrew due to an injury. Amid speculation of match fixing, the crowd for the final loudly booed Serena when she came out to play the final and continued to boo her intermittently through the entire match, even to the point of cheering unforced errors and double faults. Williams won the tournament and was subsequently booed during the awards ceremony. The following month at the Ericsson Open, Richard Williams, Serena and Venus's father, claimed racial slurs were directed at him while in the stands. Neither Venus nor Serena played the tournament until 2015, when Serena Williams played in the tournament, ending her 14-year boycott of the event. Venus Williams ended her boycott by competing in 2016. ^ "Google Maps". Google Maps. Retrieved 8 February 2016. ^ "Indian Wells Tennis Garden – Site Facts". Retrieved 8 February 2016. ^ "2014 Indian Wells Tennis Garden Expansion". ATP. March 3, 2013. ^ "The Long and Winding Road to Indian Wells". The Beverly Hills Courier. Archived from the original on 1 March 2013. Retrieved 12 March 2013. ^ "Larry Ellison opens his wallet for Indian Wells event". USA Today. 13 March 2011. Retrieved 12 March 2013. ^ "Top 15 Moments Of 2015 Tournament". BNP Paribas Open. Retrieved 8 February 2016. ^ "Williams booed after Indian Wells win". CNN. ^ "Racism charges swirl as Williams sisters advance". CNN. ^ Williams, Serena (4 February 2015). "Serena Williams: I'm Returning to Indian Wells". Time. ^ "Venus books return to Indian Wells". WTA. 2016-01-27. Retrieved 2016-01-30.